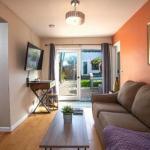 Offering free WiFi San Diego Balboa Park Rental offers a studio and a 1-bedroom apartment both equipped with fully-stocked kitchens. Balboa Park is 2.4 km away. A flat-screen cable satellite TV and a seating area with a sofa are provided in these accommodations. Each unit includes a walk-in closet and a 2-person shower. The upper level 1-bedroom apartment features a small balcony at the top of the stairs near the front door. For convenience a washer and tumble dryer are provided. Guests of San Diego Balboa Park Rental can relax in a large courtyard that includes a hammock. BBQ facilities and a garden are offered on site. Downtown San Diego is 3.6 km from this property. San Diego International Airport is 7 km away. Free guest parking is available.